Xavier Hernández Creus (born January 25, 1980, Terrassa, Catalonia, Spain), normally known as Xavi is a Spanish footballer who plays in central midfield for Barcelona. He currently plays for FC Barcelona and has been capped 43 times for the Spanish national team. He played for his country at Euro 2004 and the 2006 World Cup. He is renowned throughout Europe for his exceptional passing ability and technique. Xavi has spent all of his footballing life at the Camp Nou having joined Barça when he was only at the tender age of 11 years. He quickly made his way through the youth and reserve teams and was a key member of Jordi Gonzalvo's FC Barcelona B team that won promotion to the Segunda División. Xavi was born in the famous street of Barcelona, La Rambla. but believe it or not Xavi was a RCD Espanyol fan this was because his family was strong Espanyol fans. His grandfather Julio Hernandez was team captain in the 1968 season also Xavi's younger brother Quique plays for Espanyols B team. His exceptional growth throughout the teams earned him a full debut on August 11, 1998. He quickly went on to become a key member of Louis van Gaal's title winning first team. He won his first Spanish cap on November 15, 2000 against Holland and has since been a regular fixture in the Spanish squad. Xavi has endeared many fans with his long-range passing ability and deft touches to open opposition teams up. These, coupled with his steady composure, qualify him as one of the classiest midfielders in Europe. When on the pitch he shows no nerves whatsoever as he guides the team with an extraordinarily cool head. Since taking on the mantle of playmaker at Barca he has shown incredible vision on the pitch. Even though he is most used as one of the more attacking midfielders he is more than capable of playing at the position just in front of the defense, where he exceptionally controls the pace of the game. Since the title-winning season 2004/2005 he has been third captain of the team. His trip to the World Cup was in doubt due to a knee ligament injury, but Xavi recovered well in time and was named as part of Luis Aragonés' squad. His importance to the team was summed by Aragonés when he said "People say it is a gamble to take Xavi with us, but I say it would be a crazy gamble to leave him at home." Throughout the tournament Xavi showed his importance to Spain, consistently setting up his teammates with his well placed passes. Xavi was named Man of the Match in Spain's first match against Ukraine and played in all of Spain's other three matches, before they were knocked out in the second round. Xavi is contracted to Barca until 2010, which carries a buyout clause of £100 million. 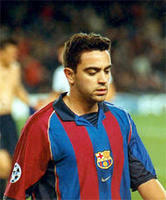 On sunday,september 2 2007, Xavi played his 250th game with barca, at the age of 27.